The Friends group was formed in July 2007, and now has a membership of 51 as at the end of March 2011. Although about 40 members live in and around South-east London, others live further away, including Canada. The Friends group had 7 open meetings during the year, excluding the 2009 AGM, plus one other committee meeting. 7 “work sessions” have taken place, including two in conjunction with the Council’s Nature Conservation Department’s Nature’s Gym. Work has varied from ivy clearance from the chapel to scraping grass from the paths near the old toilets to filling builders’ bags with leaves. Numbers have been steady at 3 or 4 members for rather uninspiring but essential work to complement the work done by Cemeteries’ staff. The loss of labour from Envirowork and then Glendale plus the expected cuts in the Bereavement Services’ budget and possibly staff losses means that the level of maintenance carried out by the Council is expected to fall. The development of the bird hide has been put on hold. The group has discussed restoration of memorials, including the Hither Green & Sydenham airship deaths memorial in the Ladywell Cemetery, but recognise that specialist skills are required. One of the advances in this year has been the advent of public guided walks. Jeff Hart kicked off with one in April for FONC members; this was followed in May by one as part of the Brockley Max Festival. Including these, a total of 6 have been held. Thanks are due to the members who have led these walks, and the members who have come along in support. Knowledge is built up with each successive walk, and members continue to research and pinpoint particular memorials of interest. A highlight of the year was the dedication of a new memorial to Ernest Dowson, decadent poet. Members assisted Philip Walker who instigated the project; over 80 people attended the dedication in August, and the event featured on national news. The group again took part in an Armistice evening event organised by John McKiernan. The evening was again well attended and despite lack of funding was a success. John McKiernan attended a feedback session with the Group. He also updated the group on his future plans. We held our first Remembrance Day event, laying wreaths at the two war memorials and picking three relevant points of interest in between. Our second noticeboard was installed in the Brockley Cemetery in July. Colin Burgess and his colleagues are to be thanked for carrying out the work. The noticeboard was the result of a successful application made to the Ladywell Ward Assembly for a further grant of £1000 from the Locality Fund. The group had stalls at the following events in the year: at the Friends of Nunhead Cemetery Open Day (May), and Gordonbrock School Annual Carnival (June), and at an event in Ladywell Fields organised by Living Streets and the Council’s People & Rivers Project. This Project also organised an evening nature walk in the Brockley Cemetery, led by Nick Bertrand, in September. A number of Friends attended despite the short notice. 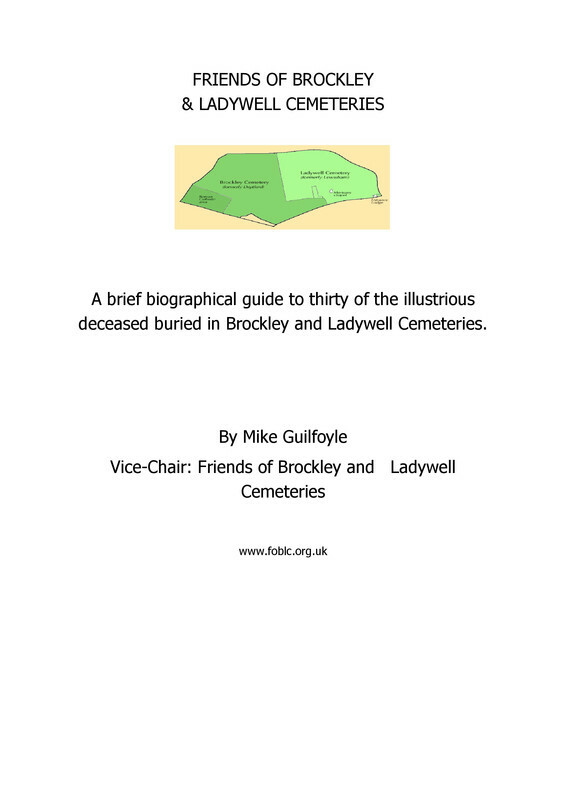 The group is represented on a committee of local groups, granted funds from the Council’s Ward Locality Fund, developing a walking tour map of Ladywell, which includes part of the Ladywell Cemetery. The group is also represented on the Council’s Biodiversity Partnership. The Friends remained a member of the National Federation of Cemeteries’ Friends, and attended the 2010 AGM hosted by the Friends of West Norwood Cemetery. The website and BlogSpot, managed by Patrick Napier, continues to be the channel for enquiries from within the UK and abroad about friends and relatives buried in the Cemeteries. 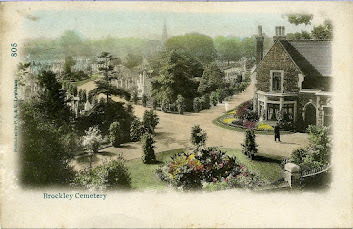 Members of the group have assisted in identifying and photographing particular graves, and writing them up for the Blogspot. As a result members have been able to supply information to enquiries from Australia and Canada, and in turn have been supplied information from people who have particular interests. It is hoped to develop a publishing programme using the research information. I would like to thank members for their continued enthusiasm and support over the past year; also to Jeff Hart, the Co-ordinator of Friends Of Nunhead Cemetery for his guidance, and to Nick Pond and Jessica Kyle of the Council’s Nature Conservation Department for their advice; also to Colin Burgess, Irene Kemp and Shirley Bishop, the Council Officers responsible for the Cemeteries for their co-operation in the past year.